Sports films. They're boring, right? Always with the same old underdog story: Guy gets bullied, meets cute chick, makes a fool of himself, meets old master, attains mad skills, wins the final championship and gets the girl. So if you're gonna make yet another one of these tired formula films, why not go all in, and make it so over the top, it's a parody of the whole genre? 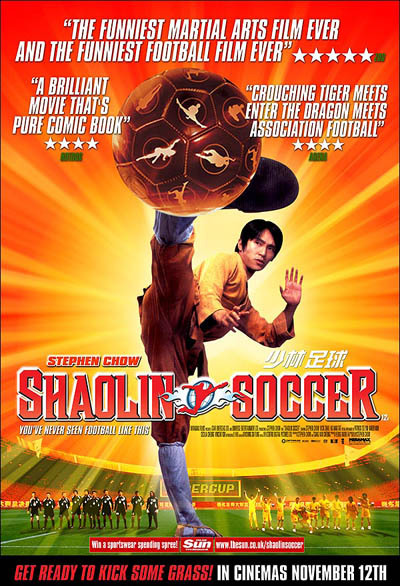 That's exactly what Shaolin Soccer is. A campy, tongue in cheek poke at all sport films, where all the characters are 100% stereotypical and has supernatural abilities to boot. Seeing this film will definitely make you hungry for more, and while there's also a Battlefield Baseball film, it is a not at all in the same league as this gem, and you're much better off checking out what else Shaolin Soccer's writer/director/star Stephen Chow has done; first and foremost Kung-Fu Hustle and God of Cookery.